What could you do with a cost-effective digital piano with amazing additional features that will significantly contribute to your playing experience? 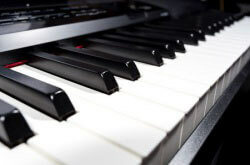 How about a digital piano with everything you can require whether you are a beginner or experienced player. If you are wondering what I am talking about I will give you a hint; it’s all about the Yamaha DGX-660 review. Over the years Yamaha has impressed its customer with the flagship model of the Yamaha’s portable grand. In the line, there came Yamaha DGX-660 that has remained to be one of the top-selling digital pianos. The digital piano has plenty of great features that take the playing experience to the next level. How Is It Different From DGX-650? When it comes with things like polyphony, sounds effects and other features, the DGX-660 has replaced its predecessor the DGX-650. On top of that, the piano comes with hundreds of songs, styles sounds, and rhythms that makes it a perfect instrument for music making and learning. 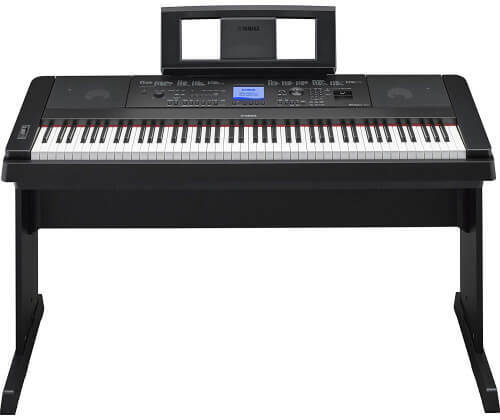 Moreover, as mentioned in many Yamaha digital keyboard reviews out there on the DGX-660, the keyboard is a hybrid of an arranged keyboard and a digital piano. In this DGX-660 review, we will cover everything you need to know about the digital piano as well as its strong suit and flaws. Even though the DGX-660 is part of the portable grand line, it is large and heavy compared to other models in the series. It features 55”X 17.5” X 5.7” which is quite a standard size for the 88 keys. It weighs 46.3 lbs. (without the stand) and 61.75 lbs. (with the stand). The DGX-660 comes with an attractive matching stand that is sturdy enough to hold the weight of the keyboard. It comes wrapped in a large heavy box of about 100 pounds; it can be a good idea if you look for another person to assist in carrying and assembling. The keyboard has a contemporary design with an attractive wooden element that can be either black or white. Because of the many additional features present on the keyboard, it has lots of buttons on the control panel. They help you get easy access to the settings in just a few presses. It also features a 320×240 LCD screen that makes your playing a lot more comfortable. This display can show you the current score, notes and lyrics of the songs you are playing or you need to play (present in lesson function). Yamaha DGX-660 keyboard features Graded Hammer Standard key action that is commonly found in the P-45 and P-115 digital pianos. The GHS action reproduces the feel of an acoustic piano where you find the keys on the low end are heavy and lighter in the higher ranges. With this kind of key action, you get the technique and the finger strength that you require when performing on an acoustic piano. The DGX-660 keys are touch sensitive meaning that you can control the sound volume depending on how hard you press the keys. They are made of plastic with the white keys has glossy finish while the black ones are matte. You can also adjust the sensitivity of the keyboard to fit your playing style where you choose between soft, medium, fixed and hard. When you select the fixed action, you will play the keyboard in the same volume no matter how hard you press (the keyboard will be non-touch sensitive). 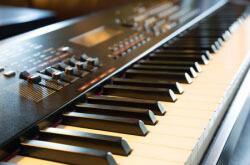 Yamaha DGX-660 comes with the Pure CF sound engine like the one found in the Yamaha P-115 or the P-255. This sound engine produces the carefully recorded Yamaha CFIIIS grand piano, the first natural piano sound in the DGX-660. The Keyboard has ten different piano sound and hundreds of other instrument sounds which gives you a room to be creative and learn on. On top of that, the piano has a library of sound effects that you can use to make the playing more unique and exciting. 41 reverb – they stimulate acoustic environments like the concert hall, stage, rooms and other interesting reverbs. 44 chorus types that make your sound thick, and rich, stimulating timing variation and subtle pitch giving the feel as multiple players are performing in unison. The DGX is equipped with a pitch bend wheel that allows you to produce exciting effects by bending notes while playing. There is also master equalization that helps in tailoring your suitable sounds and DSP (Digital Signal Processing) for further transform and customization of the music. Compared to its predecessor, the DGX-650, this model has expanded its polyphony from 128 to 192 notes. With the keyboard, you can easily play and layer multiple sounds, accompaniment styles and backing tracks without the worry of notes dropouts and memory capacity. The DGX-660 comes with two built-in speakers and a 6W amplifier that produces a well-balanced sound. The speakers positioning produces quality sounds that give you a clear and muffle-free experience. The speakers are sufficient for home performance or even a small room. However, if you need it for stage setup or more prominent performances, you will need a PA or an external amplifier for a powerful sound. Other than that, the keyboard has an Intelligent Acoustic control function that further improves the sound quality where it adjusts the tremble and base frequencies making it more clear and balanced. Apart from the qualities that give a realistic piano experience, the DGX-660 comes equipped with quite some features that are commonly seen on controller keyboards. The DGX entirely covers any beginner player – 660 with the Yamaha lesson features called the Yamaha Education Suite. 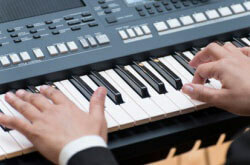 The feature allows users to use MIDI songs for left, right or both hand lessons. The LCD also shows you the notes you need to play and the keys making it easier for you even when you don’t know how to read the music you are playing. The keyboard can work with both MIDI and audio data files. It can record and save your recordings and play downloaded music from the internet in both formats. With the keyboard, you can record up to 6 tracks that can be played back as one song or even turn off some tracks to listen to others. The recordings can also be edited, whereby you can adjust the tempo and add filters and effects. The DGX-660 comes with layering splitting modes where you can play two instrument sounds simultaneous. With so much built-in sounds, exhausting the music creativity option is close to impossible. Overall, the DGX-660 is an excellent instrument for both experienced and beginners. 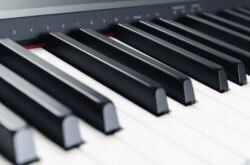 It’s one of the best digital piano options under $1000. It has an attractive and design and offers a large number of features not to forget the great piano and other instrument sounds. To wrap up, I would recommend the keyboard to those in need of a more than just a digital piano with few basic functions and several instrument sounds. Therefore if you want to go for something extra with greater playing experience, DGX-660 is an excellent choice, with an expandable functions made possible by the connectivity features.